A few months ago I finally took the plunge and signed up my two oldest girls, ages 7 and then 9, for the Little Passports program. We love to travel and we love to learn about new places and I thought this might be a fun, educational activity for us, and even though I love planning our days, pouring over curriculum and prepping stuff, I was drawn to the idea of every month a packet coming in the mail that was all inclusive and the work already done. We signed up for the world edition, which is recommended for ages 5-10. The girls were excited to have a package come in the mail addressed just to them! Soon after our first “package” we received our first country package. They are smaller, but I was impressed with the quality of the items. Our first country was Brazil and the package included a postcard, activity worksheets, and also a real gemstone that originates from this country. Each month, a new packet comes. So far, we have visited Brazil, France, and Egypt. The kids look forward to their packet coming. We find it on the map, add our own activities as we choose and the girls love playing the online educational games they have access to that coordinate with the countries as part of the program. It took me about a year to sign my girls up from when I first started thinking about it. I only wish I had signed them up sooner! Le sigh! Little Passports Sale: 40% Off Your First Month! If you homeschool year round, this is a fun learning activity to add to summer. 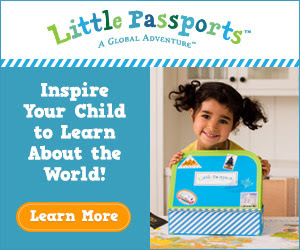 If you don’t homeschool year round, but want some fun educational activities to add to the calendar Little Passports is here to help take the edge off all of that scheduling too with their educational and fun activities by celebrating the end of the school year with an amazing deal: 40% off your first month of a new Little Passports Monthly Plan subscription using promo code: FUN40. This deal runs from Friday, 5/16 through Thursday, 5/22 11:59 PM EST. With the 40% discount applied, your first month will cost just $7.17 + shipping! This offer can not be combined with any other offer and can not be applied to previous purchases. The adventures of Sam and Sofia will be sure to keep your kids busy this summer while inspiring them to learn about the big beautiful world we live in! I strive to only share and recommend only those products which my own family has enjoyed or had success with. This is definitely one of those. My girls love doing Little Passports! I so love this idea! This is one great homeschool activity that we have to try!